Say, that was some US Open the past fortnight, yeah? It was Upset Central from start to finish, with the 1 seed (Serena Williams) playing the 10 seed (Caroline Wozniacki) in the women’s singles finals, and the 10 seed (Kei Nishikori) playing the 14 seed (Marin Cilic) in the men’s singles final. 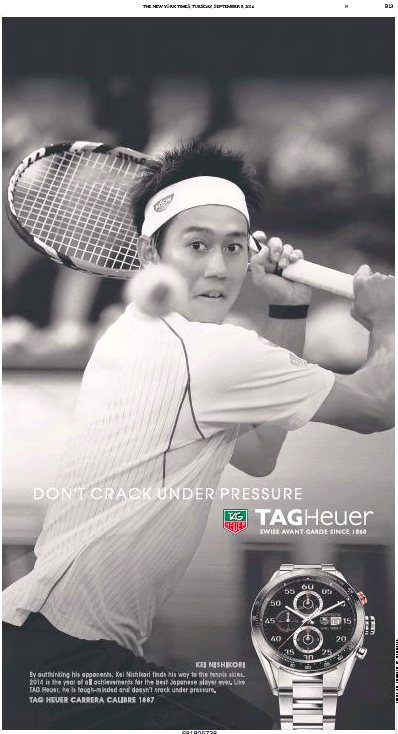 In the wake of Cilic’s dismantling of Nishikori in Monday’s championship match, this TAG Heuer ad ran in Tuesday’s New York Times. This entry was posted in Uncategorized and tagged Caroline Wozniacki, Kei Nishikori, Marin Cilic, Serena Williams, TAG Heuer, US Open. Bookmark the permalink.